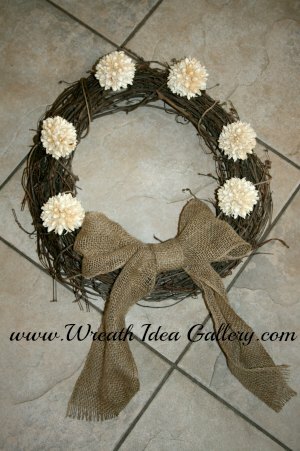 After I spent the afternoon in Michael's picking the items out, (takes me a while because there is so much to choose from); I was able to put this wreath together rather quickly one evening. 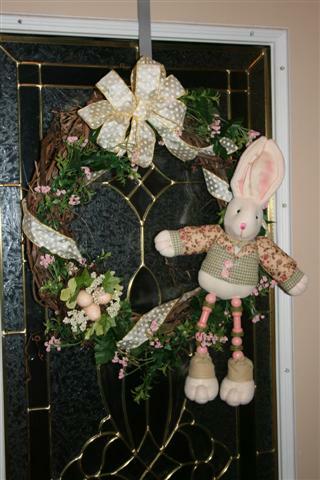 I love rabbits so; I really love this time of year because there are so many rabbits on the scene, so I definitely had to have a bunny rabbit on my wreath. 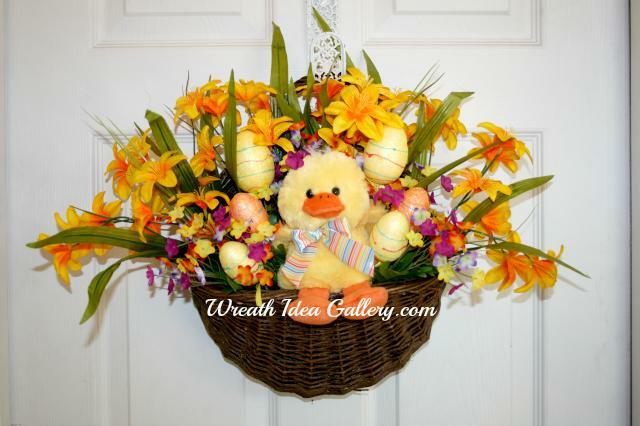 Easter Wreath you would like to Share? 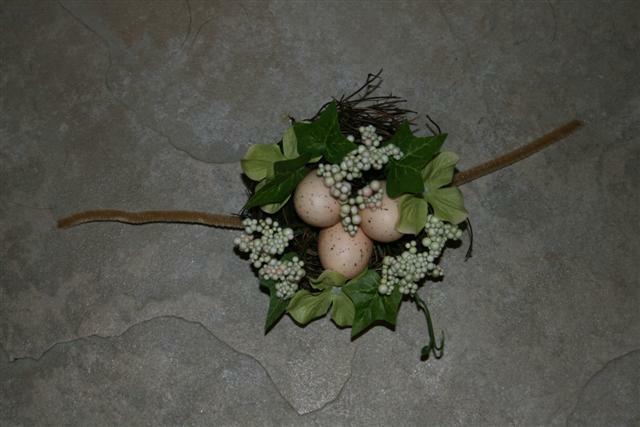 I started with a simple grapevine form, but some other forms that would be great for the occasions would be a straw hat, bonnet or a half basket made to hang on the door. I added some green sprigs with little pink buds. 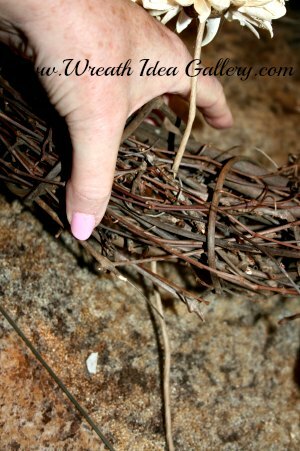 I bought them in a bunch and used wire cutters to cut them apart and just stuck them into the grapevine. 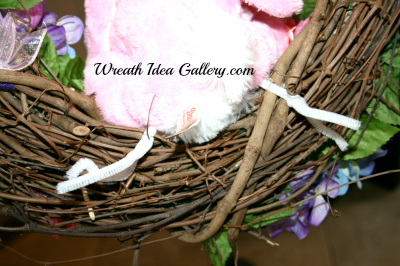 I used a fine ribbon twine to attach the bunny rabbit on the side as my main focal point. Then I made a yellow bow with white polka dots with my EZ Bow Maker. 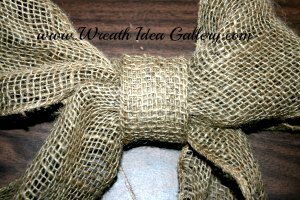 Leaving the one end long, I situated the bow on the top and tied it onto the grapevine form and then wrapped the ribbon softly around and tucked it in at the top. I bought a little bird nest with some eggs that matched the peachy pink color in the bunny rabbit sleeves and threaded a fuzzy stick through the back and then attached it to the opposite side of the bunnie. 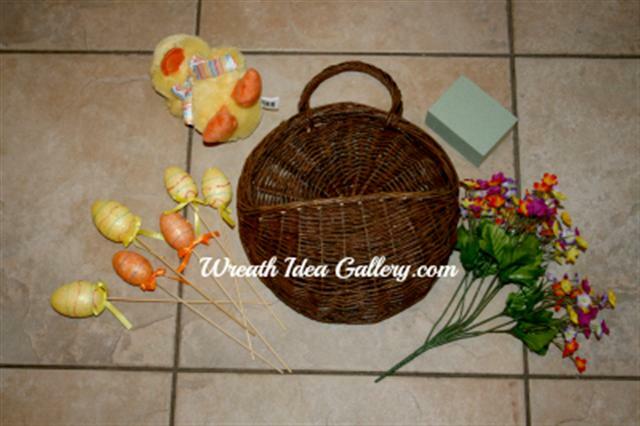 Everything is stuck or tied onto the grapevine which makes it very easy to put together and easy to modify. You may decide to modify your design and give it a new look for next year with a few changes. 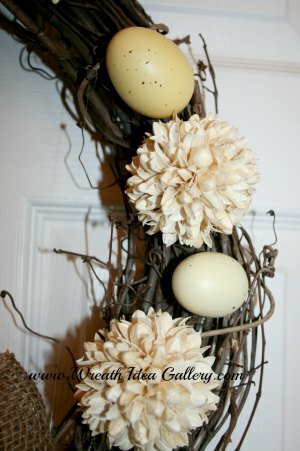 Natural Easter Egg wreath starts on a grapevine wreath form. 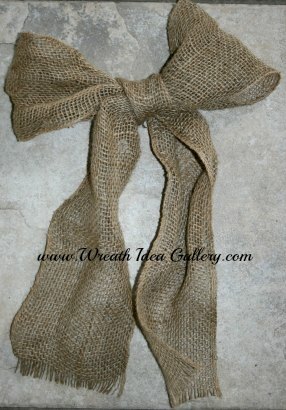 Burlap bow tied just like you would a bow, but I took a small scrap and folded it in thirds and wrapped it around the center to give it a more finished look. 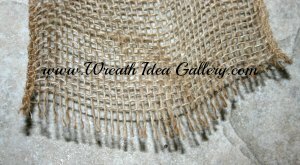 then pulled some of the burlap from the ends to have a short fringe. Next I took six dried flowers and pushed them through the grapevine and secured by wrapping the stem around the grapevine. 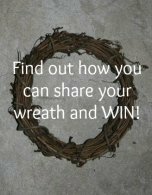 Because mine was natural in color it blended in with the grapevine wreath. 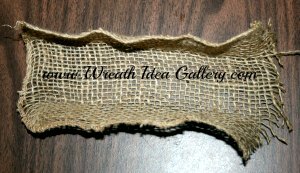 Add a few plastic eggs with hot glue and it is ready to hang. 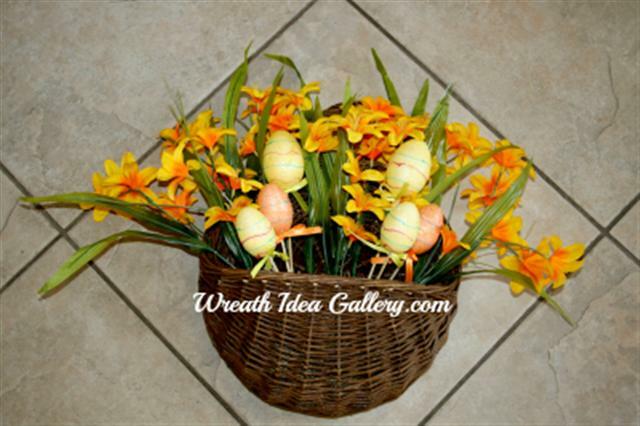 Because of the natural colors this wreath can hang as an Easter or Spring wreath. 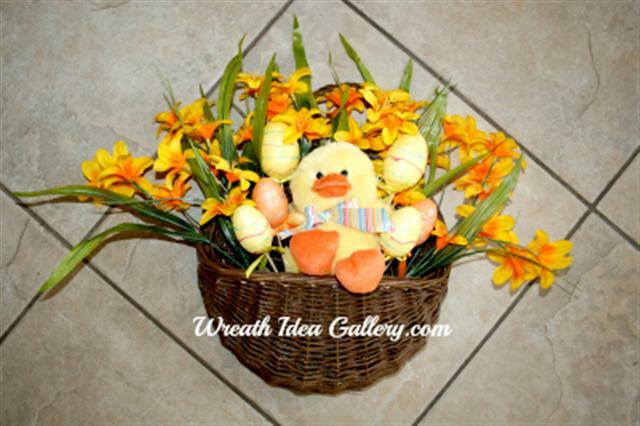 This little bunny can brighten your Easter door. 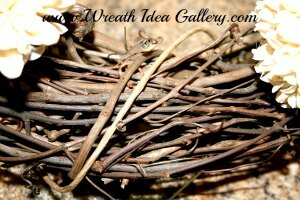 The stems were to long so I used wire cutters to cut stems to a length just long enough to poke int the grapevine wreath. 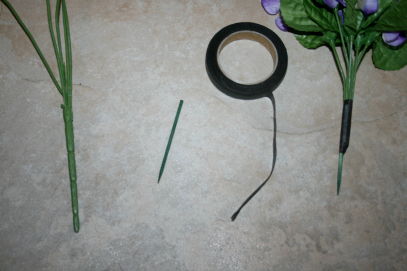 Attached the floral stick with the floral tape to make a new shorter bouquet. 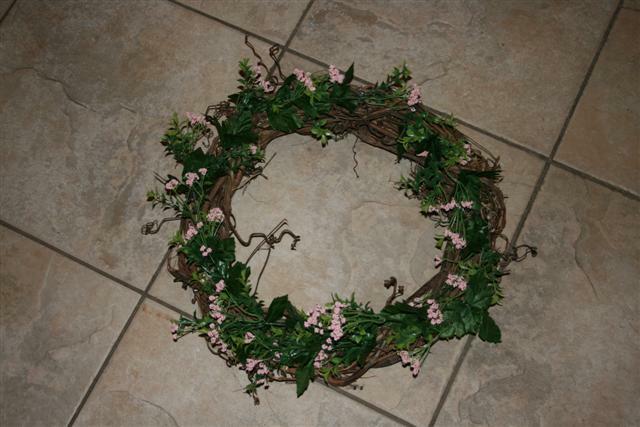 Arranged the flowers and poked them into the grapevine wreath. 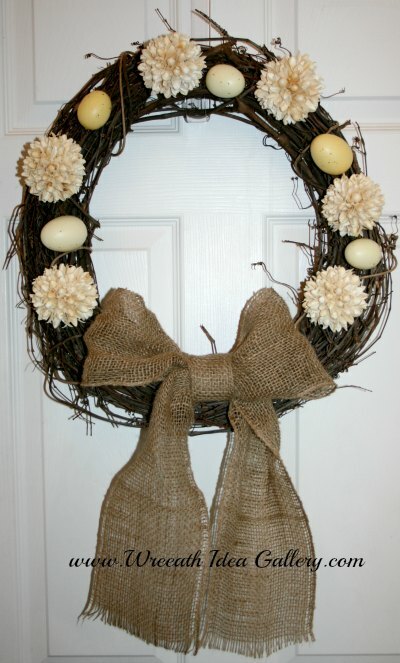 Added a few eggs by sticking the stick into the wreath. 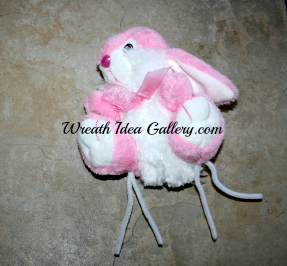 Attached 2 white fuzzy sticks around the legs of the bunny and the used them to attach the bunny to the wreath. I made a bow with my using my E-Z Bow Maker with 2 colors of ribbon. 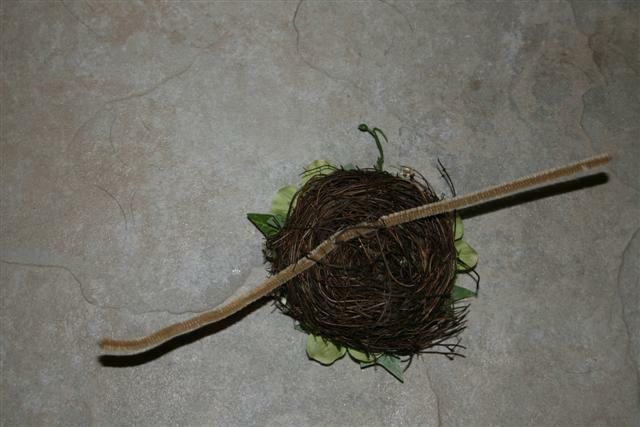 I left long tails so I would be able to wrap around the grapevine down to the flowers, and attached by tucking in the grapevine. 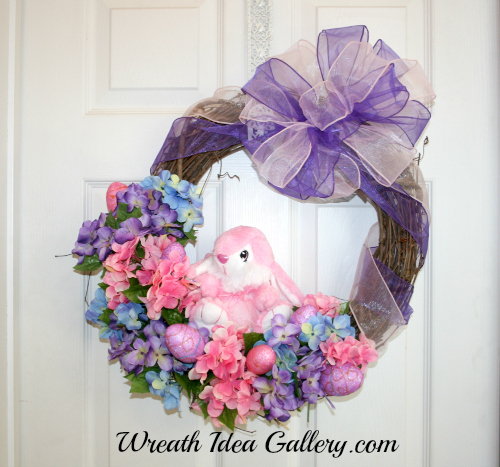 NO GLUE used on this wreath so it will be very easy to remove the bunny and eggs and you will have a beautiful hydrangea wreath for spring after Easter. This cute little chick is ready for Easter! Put your chunck of styrofoam in the basket. Start with a layer of taller flowers across the back, securing them in the foam. 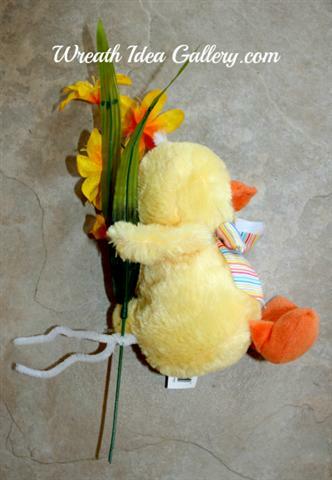 Take the fuzzy stick and wind around part of the stuffed animal and then attach it to one of the flowers. Secure the flowers in the foam and your stuffed animal should be comfortably seated. I added some smaller flowers to fill in the gaps.